Artitec Models There are 2 products. 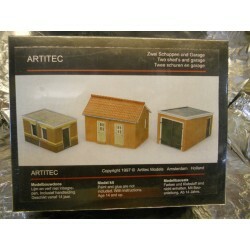 ** Artitec 10116 2 Brick Sheds and Garage Model Kit, Paint and Glue Not Included, With Instructions, (52mm x 30mm) (60mm x 37mm) (36mm x 62mm) height 45mm. Made in Resin, easily painted. 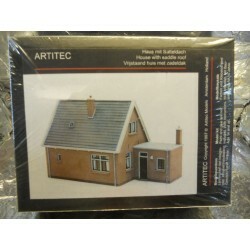 ** Artitec 10115 House with Saddle Style Roof Model Kit, Paint and Glue Not Included, With Instructions, 133mm long x 85mm high x 58mm deep. Made in Resin, easily Painted.